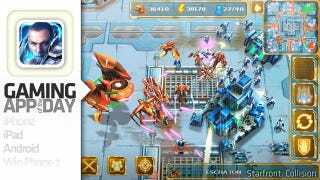 Gameloft brings StarCraft II—or at least the closest thing to it—to the iPhone with Starfront: Collision, a sci-fi real-time strategy game that works surprisingly well in such a tiny space. Should Blizzard be worried? Maybe it should simply be flattered, for Starfront: Collision is blatant in what it borrows from StarCraft. There are three races, the human Consortium (which are voiced like space hicks, naturally), a bug-like species called the Myriad, and the Wardens, a sentient mechanical lifeform. Starfront plays just like the game on which it's modeled—start with a small base, a handful of workers to harvest ore and energy and the promise of an intergalactic skirmish. While there doesn't seem to be as much wild variety between the three races as in StarCraft, they follow the aesthetics and unit types of the Zerg, Protoss and Terrans closely. The Myriad will spawn Grubs that sacrifice themselves to build squishy organic units. Wardens chirp and whir. There are smaller tech trees and fewer units than in StarCraft, but the rules are close. Control on the iPhone, from my experience, works rather well. Units are teeny tiny when the camera is fully zoomed out, making precision movement and attacks a little tougher, but the interface is surprisingly effective. Players can select a single unit with a tap, moving it around the map, or they can select a group of units by placing two fingers on the touchscreen. Starfront will immediately draw a selection rectangle that's perfectly adequate. Building and placing structures takes some getting used to, but in general, navigating maps, moving units and selecting things with the iPhone's touchscreen is usually more accurate than it is frustrating. The offering is robust, with a small but well-rounded selection of buildings, units and vehicles that can be built and researched. Almost everything you'll see in Starfront: Collision, you've seen in a StarCraft game. Starfront also offers online multiplayer and local multiplayer skirmishes, something we haven't been able to test just yet, but will soon. The game is listed as a "free" purchase on iTunes, but consider it little more than a trial version. The 679MB download offers four well-designed, fully voiced tutorial levels and one quick skirmish single-player map. To play the full thing, a $6.99 USD in-game purchase is required, unlocking a single-player campaign, multiplayer modes and seven skirmish maps. If you're looking for a decent real-time strategy game for the iPhone and don't mind some egregious swiping from Blizzard's StarCraft series, Starfront: Collision is a good enough option from our brief hands-on time with the game. Just don't expect much originality.